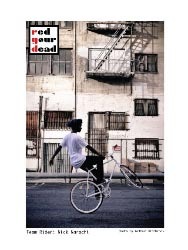 Red You r Dead is a bicycle company based in Los Angeles, focusing on ready to ride fixed gear bikes. We believe in providing a well crafted bicycle with the urban rider in mind. Our bikes are built with precise geometry to give the rider peak performance when throwing new tricks or just mashing on their daily commutes. For more information visit our website or contact our sales department.